My mom has two Yorkies, Gracie and Ruby. ...and they always ignore Beverly when she comes to visit. A few summer's ago when I was visiting my mom, I took a picture of them looking at me through a back window of her house. At the time, I only noticed Gracie and Ruby on the left-hand side. It wasn't until I downloaded the picture that I saw my little fat Bev standing all by herself on the far right. Isn't that the funniest/cutest thing ever? 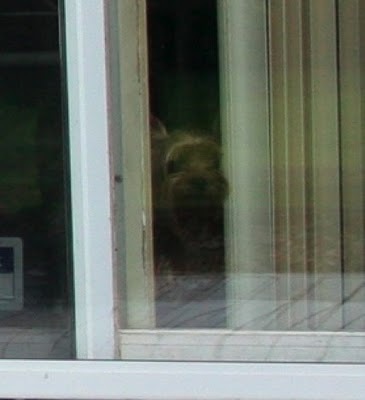 She has such a sad look on her face, like, Mommy, please come back inside. Don't leave me in here alone with these two. You're my only friend. I don't know why I shared this... I've just always loved this picture, I guess. It makes me laugh.